Hello From Montana....where it alternates between clear and beautiful...and smokey from the forest fires and hot. Yesterday we watched a pileated woodpecker, about the size of a small crow, take a long bath in our little 'pond'. 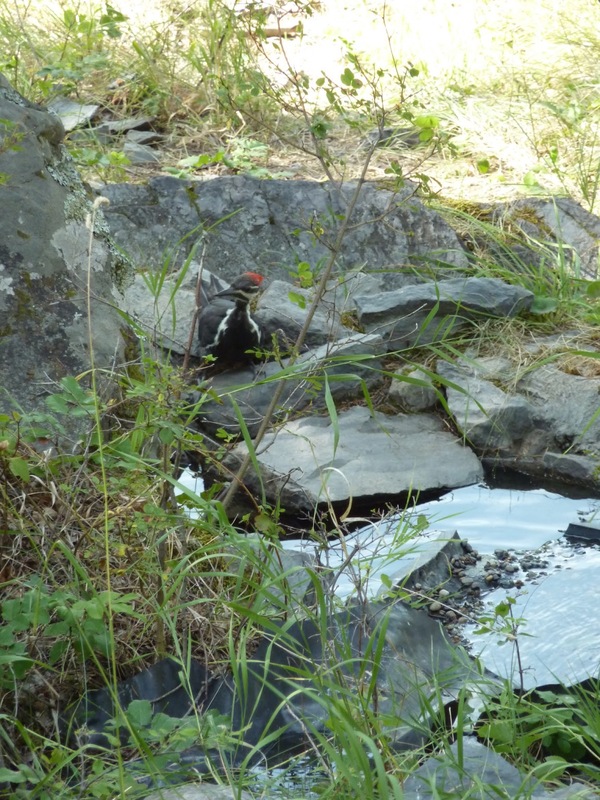 The pond is only about 12 feet from the porch so animals are up close and personal when they come to take a drink. 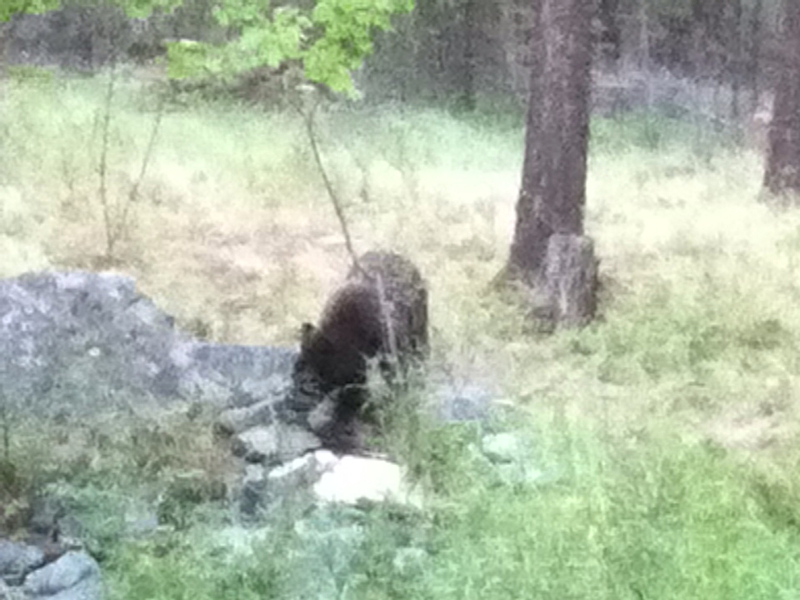 This became obvious a few minutes later when a black bear showed up and hung around for a while. The photos are bad because I could only find my cell phone camera. Marilyn picked 'Heirloom Roses' so that leaves 'Harbor Walk', 'Cape Naden', 'Along the Dock', 'Ran's Beach Chairs', 'Log Raft', and 'Canning Time'. I need Blanche and Carol to contact me with their choices. Because it was a tie for second place I flipped a coin and Blanche gets first choice. Would you contact me by email because I don't think I have your address. Time to get back to relaxing. Over a hundred comments from thirty plus people! Thanks for all your input and compliments. How to pick was a problem as I couldn't see cutting up that many little slips of paper to put into a hat. 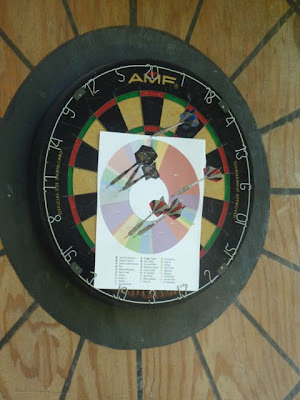 Then I had this pie chart idea and remembered that since Gary and Debbie were cruising in Alaska that their dart board wasn't being used..... Brilliant. So I threw six darts from a long way away and, with my own little system of rules, was able to randomly select winners. First place goes to Marilyn Gottlieb, a wonderful photographer and long time commenter to this blog. BUT....there was a tie (how could THAT happen?) for second place so two people get to select after Marilyn makes her choice: Blanche Niznik and Carol Collier. Congratulations. 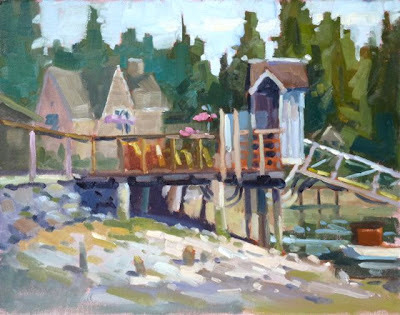 The winners can choose from 'Harbor Walk', 'Cape Naden', 'Along the Dock', 'Evening at the Cove', 'Heirloom Roses', 'Ran's Beach Chairs', 'Log Raft' and 'Canning Time'. Let me know which one you like, Marilyn, and I can then let Blanche and Carol know what they can choose from. I had a good time....hope you did too. I'll do this again so stay tuned. Remember that painting give-away? Well, I'm about to announce the winners as soon as it all gets tabulated. So many great comments. I'm on my way to Montana tomorrow and will let you know the contest results later in the week. You will be impressed with the method I used to make the picks. Stay tuned. Those of you that have my book, 'Value Sketching With Markers', may recognize this from the front cover. I've always meant to get back to it with paint but summer is pretty much the only time with the lowest tides in the day time. So yesterday had to be the day. Big shapes followed by doodads.... In the marker drawing I didn't include any background buildings but it was formatted somewhat differently. They both work, I think. I personally keep wondering who lives in the house even though I know it's actually a restaurant. Keep in touch. I'll be back with the winners in a few days! Last Chance to Enter the Painting Giveaway! Make a comment on the blog, by sending me an email or on Facebook. You have nothing to lose....and I feel more connected when I read your comments. OK. One oil and one acrylic....I'm sure you can tell the difference. These weren't supposed to be the final paintings but time was running out for me as I'm getting ready for some extended painting and travel. Stay tuned. Painting is such fun. I've given up trying to figure out what people like and now I just paint what appeals to me. 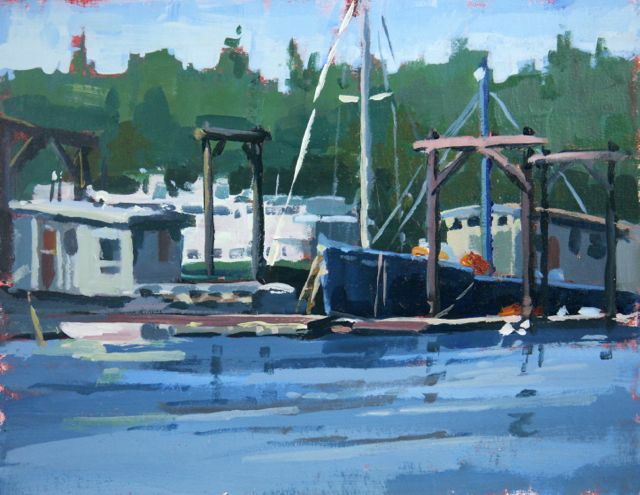 Predicting what catches my eye enough to paint is impossible. I wouldn't have thought that either of these paintings would be things I'd do....but here they are. It's the unpredictability that is part of the fun. 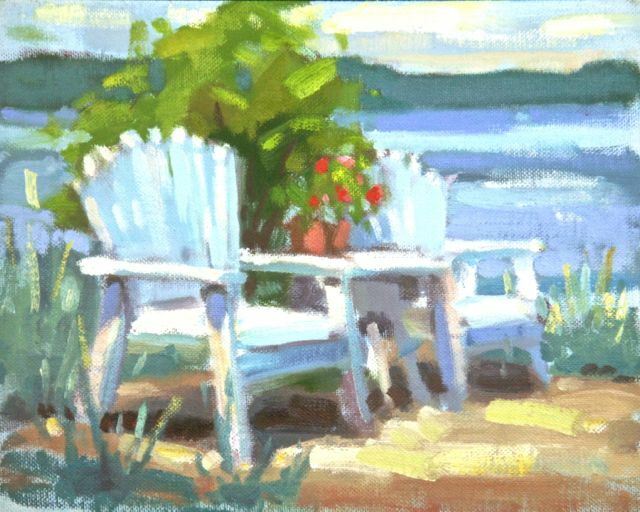 Dianna Shyne let me tag along at her acrylic workshop for a day and I sat on the beach and painted these. 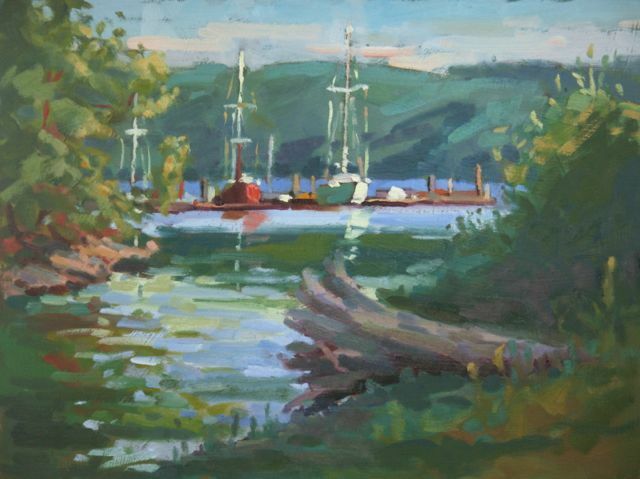 If you want excellent instruction in plein air acrylic contact Dianna.....she's the best. The blue boat is the Cape Naden, a 100 foot Alaskan fish 'packer' boat from 1908. It has been redone with 5 staterooms below and a huge diesel engine. It's for sale for only $47,000....I should buy it for my roving studio. 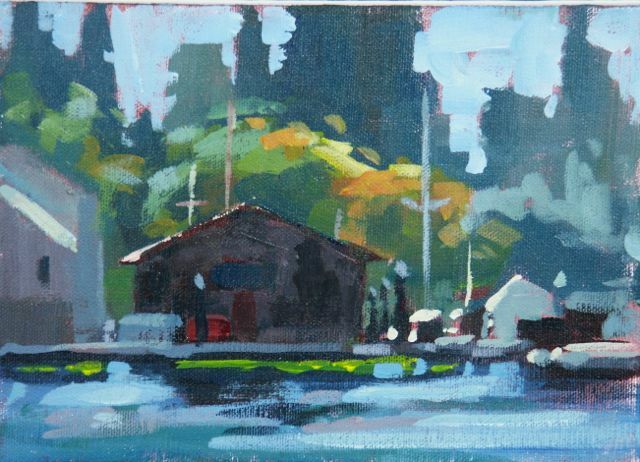 'Along the Dock' is only 6x8 and was done with no predrawing....just blocked in the big shapes and carved it out. For both of these I used only three hues, Quinacridone Burnt Orange, Thalo Blue, Primary Yellow and, of course, White. Amazing what can be done with a limited palette. Make a comment. Only one more post to the announcement of the winner.....I promise. Number Five in the 'Make a Comment and Maybe Win a Painting Give-Away Contest'.... I can't wait to see what the final painting, number six, will be.....and when it will be painted and posted. I spent an idyllic peaceful evening straddling a large log, one foot up on a rock while bending to the right and leaning over to make each stroke as the sun was setting. The next morning it took me an hour to figure out why I was feeling so sore. The board I used was an old trashed painting that had a dark green on it (similar to the shadowed green you see) and I began by putting in the light water and sky shapes. It was fun as the visual ideas took shape quickly and the board color stood in for the greens in the painting for a long time before I moved them to their finished hue and value. Make a comment. Enter to win. Now I'm giving away two.....one is so fun, why not two? Painting Give-Away #4. Make a comment to enter to win. I've been driving past these roses for three weeks wanting to paint them. 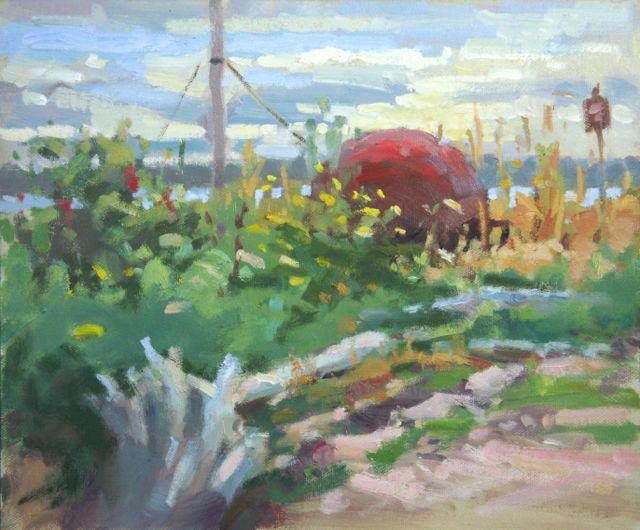 Backlit by evening light they were a challenge that necessitated more than one use of the palette knife to erase what wasn't working. It was too easy to breakup the larger shapes with unnecessary detail....I felt like I was on a teeter-totter between too little and too much. Finally I felt satisfied with this....and then wished I had used a larger canvas. I like the result. The words of Bill Reese often ring through my head. Giving a few of us a tour of his home and artwork he stopped in front of a large pastel of Mexican dancers. He said that painting was the only painting of the thousands he must have painted that he wouldn't alter or change. Those words allow me to end paintings when they feel finished rather than when they are perfect. Someday I may paint that one piece that I won't want to change....but it hasn't happened yet. Make a comment. You never know. I might just give away two. Post # 3 in the painting give-away. 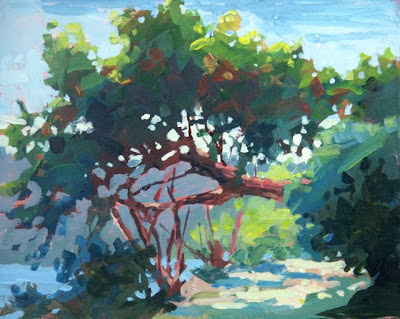 We had a great two plein air workshop days with lots of enthusiasm and very solid paintings being produced by everyone. 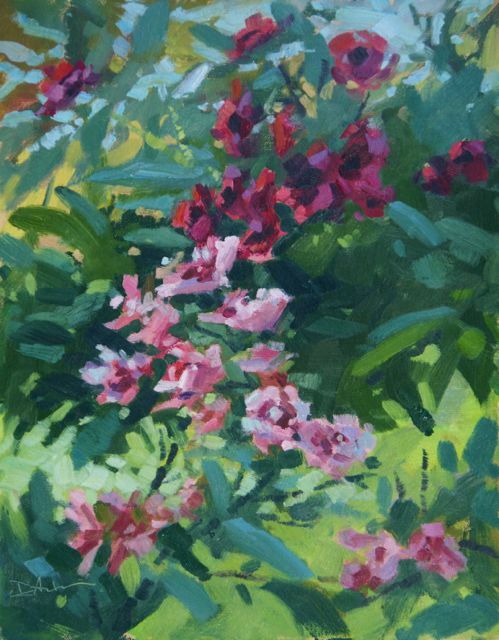 We used gouache, oil and acrylic....and they all were nice. The second day I also did a couple in between wandering around and sharing what changes I could suggest. If there was a common lesson it was 'simplify'....which I often have to remind myself.....because there is so much we see that it is tempting to do it all. The second day we were out near the end of the sandspit at Randy's little home they call the 'Playhouse'....on one side is the lagoon and just a few feet away on the other is Puget Sound where these chairs sit. An idyllic place. I had the most interesting experience. The sun was so bright (well, to someone in the Northwest) that the white paint looked like dirty purple. Even fresh from the tube it seemed to have a purplish color mixed into it. 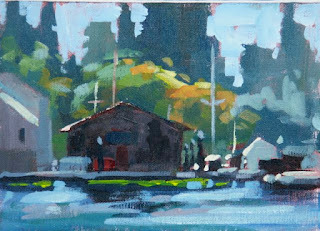 One more plein air challenge. Make a comment to enter the painting give-away. Love to hear what you have to say.